It’s that time of year again! Barbeques, lawn chairs, parades! Fourth of July is the day when we all celebrate our nation’s freedom. And then, right around the corner in the state of Utah comes Pioneer Day! Celebrating with friends, family, yummy foods and good times is the highlight of the Summer. Many of us like to include catching a fireworks display or safely enjoying a few fireworks of our own at home. While we may enjoy this longstanding tradition, for some pets, fireworks are not a reason to celebrate and enjoy, but a reason to panic. 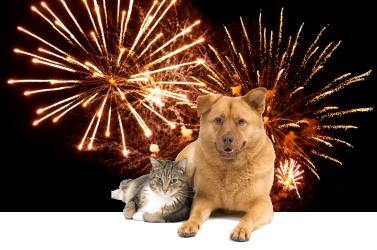 Many pets are fine with fireworks, but others are sensitive to loud, booming noises, bright flashing lights and unfamiliar smells. During these times, it is best to keep your pets safely indoors. With a little planning, your pets can enjoy the festivities just as much as you do. Try placing your pets in an interior room of your home and perhaps play some soft music. There are available anti-anxiety vests or even a tight-fitting T-shirt. These help your pet feel more secure and better able to cope with the disruption. If your pet’s reaction is severe, your veterinarian may be able to prescribe some mild sedation or anti-anxiety medication for the big night. Always be sure to practice dose your pet before the event to see how your pet will respond to the medication. Never share medication prescribed for another pet or give more than the recommended dose. Also, NEVER give pets medication prescribed for humans unless OKed by your veterinarian. Even if your pet is kept indoors, be sure your pet has a collar with ID tags. Even indoor pets can become so anxious during fireworks displays that they may break windows or door screens in an effort to escape. Remember, the best form of ID is to supplement ID tags with a microchip. Cats are typically not as afraid of loud noises as are dogs. Cats tend to hide when frightened, so always check in on your cats periodically during events. Keeping cats indoors with soft music playing will help keep them calmer. Above all, have a safe and enjoyable Summer holiday season, and keep your furry family members safe!